Welcome to The Silver Spring Church of God! The Silver Spring Church of God welcomes members, visitors, and any who would like to share in the good news of salvation through Jesus Christ! The Silver Spring Church of God is Pentecostal: we believe all the gifts of the Holy Spirit are available today. We are a ministry of The Church of God with offices located in Cleveland, Tennessee. May the Lord richly bless you! Adult Sunday School: 9:30-10:45 A.M.
All born again believers are welcome to take communion. Children’s Church meets in the Fellowship Hall after praise and worship. Adult Bible Study: 7:30-8:30 P.M.
To find someone who is hurting, lonely, desperate, and out of relationship with Christ and to bring that lost one home. If you would like to know more about our church, if you need prayer, or if you would like someone to visit you, please call us or write us at the address above. 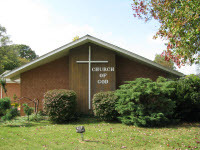 The Silver Spring Church of God is a member congregation of the Church of God, with headquarters in Cleveland, Tennessee.